Why Do We Pledge Allegiance? Here’s the little-known sto ry behind this revered American ritual and the fears that inspired it. Did you know the Pledge was written by a socialist? Or that it’s wording has been changed twice? Or that the original salute was dropped during World War II because it too closely resembled the fascist salute of Nazi Germany? Next, I interview Kimberly Staub, the Manager of Collections and Exhibitions at the Betsy Ross House in Philadelphia. She’ll tell us how Betsy Ross was “discovered” as the woman who made the first American flag in the 1890s – more than a century after the flag was created. And she’ll explain to us how the museum has changed it’s focus over the past decade to tell a larger story of colonial women in the late-18th century. Finally, I drop some fun and interesting flag-related facts on you. Do the flag’s colors red, white, and blue officially symbolize anything like courage or sacrifice? Listen and learn, people. 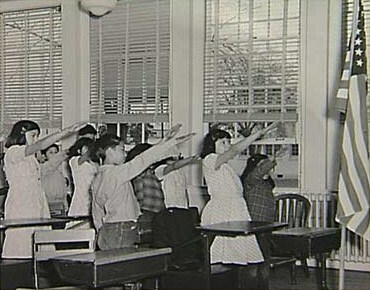 The original flag salute as described by Francis Bellamy. Because it bore an unwanted resemblance to salutes used in fascist Italy and Germany, it was replaced with the hand over the heart. 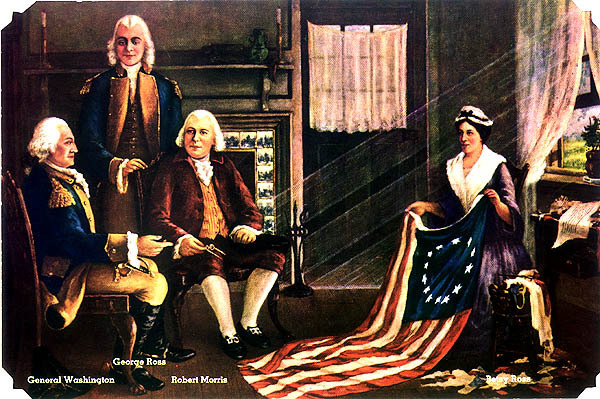 Charles Weisgerber’s 1893 painting of Betsy Ross presenting the American flag to George Washington and Robert Morris. This painting played a major role in popularizing the Betsy Ross story/myth. Jeff Gammage, “Flag Day loses importance but lives on in Philadelphia,” Philadelphia Enquirer, June 14, 2008. 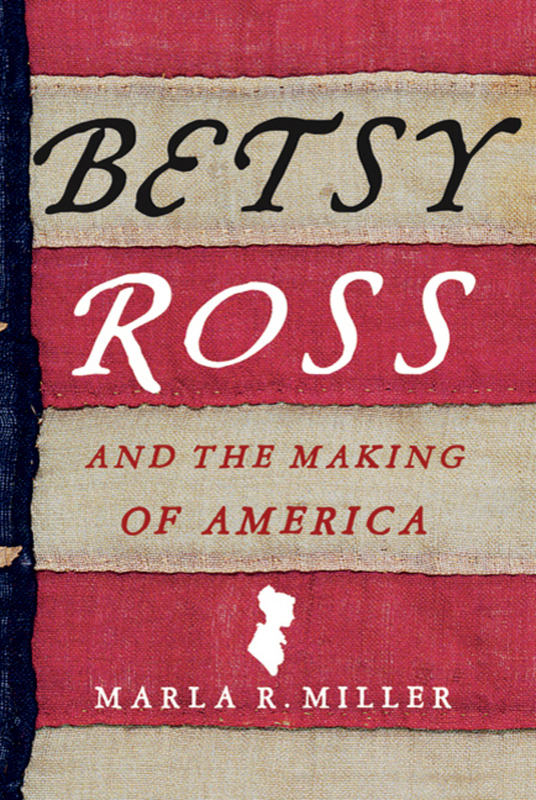 Marla Miller’s biography of Betsy Ross inspired the Betsy Ross House to rethink the way it presented the BR story. Laurel Thatcher Ulrich, “How Betsy Ross Became Famous: Oral Tradition, Nationalism, and the Invention of History,” Common-Place (October 2007).